CHSRA trains will run over the same alignment and stop at some of the same stations as JPB trains. The bi-level EMU must therefore have the same interface with the infrastructure as the future High Speed Rail cars, including clearance envelope, and platform boarding height. JPB plans to raise platform heights to approximately 50.5-50.75” ATOR (to interface with a vehicle threshold height of 51” ATOR), initially at San Francisco, Millbrae, and San Jose stations. Other station platforms on the JPB system may ultimately be raised to the same level. These requirements will likely require two sets of doors – one at high level and one at a lower level. To facilitate the scenario where all platforms are raised to the ~50.5” ATOR level, it must be possible for JPB to easily de-activate the lower level doors and add additional passenger seating in the lower level vestibule area. EMUs shall be compatible with JPB’s existing platform height (8 inches ATOR) and existing mini-highs (22 inches ATOR). In addition, EMUs must be compatible with JPB’s future level boarding platform height of approximately 50.5 to 50.75 inches ATOR. Each car shall be capable of serving both platform heights during the transition from the existing platform height to the future platform height. Design platforms for future level boarding operations, which will begin after the Caltrain fleet is converted from diesel to electric trains. Level boarding at a 25” height (versus the current 8” height) will shorten boarding time for all passengers and meet Americans with Disabilities Act requirements. This sort of inconsistency would be amusing if level boarding wasn't the most important modernization step that Caltrain must take after the electrification program is completed... and if the EMUs that Caltrain just ordered from Stadler could actually serve a 25" high platform. Barring a contract change order and significant technical modifications, the EMUs as specified by Caltrain and as recently ordered from Stadler will not be capable of boarding or alighting passengers at a 25 inch platform. 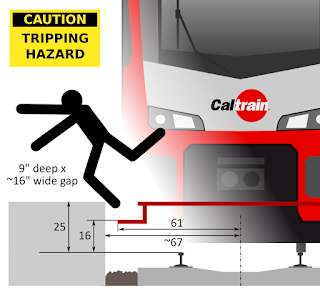 First, there's the little issue that the floor height of the lower level of the new EMU was not specified in Caltrain's contractual documents. Stadler went with the standard 22" (550 mm) above the rail, according to their specs. Stepping down from a 25" platform into a 22" rail vehicle is frowned upon by regulators. But leave that aside and imagine the trains actually had a 25" floor level that matched a 25" platform. For compatibility with the existing platform height, vehicles will require an intermediate step between the platform height and the lower level boarding threshold height, at approximately 16 inches ATOR. This intermediate step must be either removable or retractable to support conversion to a high-door-only modification once all JPB platforms have been raised to 50.5 to 50.75”. The vertical face of this intermediate step will be located at approximately 61 inches from car centerline. In addition, a ramp or bridge plate must be provided to interface with JPB’s current mini-high platforms to load wheelchair passengers. The ramp or bridge plate must comply with 49 CFR 38.95. The entire platform interface system must also be usable during the transition from the current platform height to the level boarding platform height. This is a fatal flaw. A level boarding solution must be structurally and operationally feasible, which this 9" deep by 16" wide gap is not. This is not a simple matter of welding some plates over the step wells, since the intermediate step would remain in use throughout the transition period, likely several years. The end goal must be unassisted level boarding at every station, fully compliant with the ADA gap specification of 49 CFR 38.93(d)(1). Manually operated bridge plates are not okay; conductor-assisted level boarding won't cut it for a punctual and reliable blended system where HSR and Caltrain must share primarily two tracks. This means Caltrain should either drop any talk of 25" platforms, or modify the EMU contract post haste with the same retractable bridge plates at the low doors as will be fitted to the 50" high doors. Level boarding requires a carefully engineered solution and a crisp strategic plan for how to get there. The documents cited above suggest that Caltrain still needs to get it together.